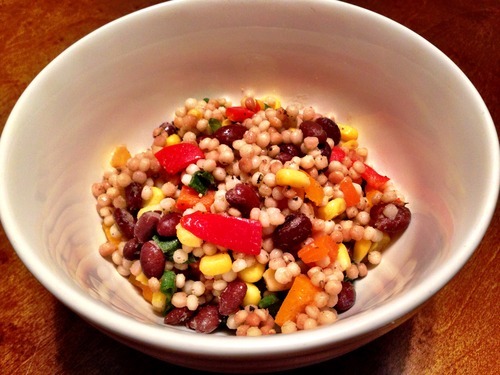 This is one of my absolute favorite sprint/summer salads! It’s fresh, light but filling, and SO flavorful. I originally found the recipe in a Self magazine book, but it’s a pretty well known recipe and you can find different takes online. Play around with the dressings and spices to your liking. Also, I like to use the Israeli couscous from Trader Joe’s. This dish is perfect to make and eat on it for the week or great to take as a side to a cookout or summer party. Hope you enjoy it! 1. Bring chicken broth to a boil in a 2-quart or larger sauce pan and stir in the couscous. 2. Cover the pot and remove from heat. 4. In a large bowl, whisk together the olive oil, lime juice, vinegar and cumin. 5. Add green onions, red pepper, cilantro, corn and beans, and toss to coat. 6. Fluff the couscous well, breaking up any chunks. 7. Add to the bowl with the vegetables and mix well. 8. Season with salt and pepper to taste and serve at once or refrigerate until ready to serve.